IHG® (InterContinental Hotels Group), one of the world’s leading hotel companies, today announces the opening of the newly-built 116-room Holiday Inn Express Asunción Aviadores hotel located in the business and commercial district of Paraguay’s capital city. The property will be the first Holiday Inn Express hotel in Paraguay and the second IHG brand in the country, joining the Crowne Plaza Asunción. Located in the vibrant Carmelitas neighborhood, the Holiday Inn Express Asunción Aviadores hotel is just 10 minutes away from the Silvio Petirossi International Airport, as well as close to many of Asunción’s popular shopping centers, restaurants and bars. The hotel’s modern, unique design and high technology complement the exclusive, personalized service and attention for each guest. As homage to its unique geography, Holiday Inn Express Asunción Aviadores has incorporated elements of ancient Paraguayan culture into its design features. Throughout the hotel, guests will find works of Ñandutí (translated as “spider web”), a typical Paraguayan needlepoint that is woven on racks in radial circles, embroidering geometric or zoomorphic motifs, in white thread or in bright colors. The hotel also boasts exquisite images of some of the country’s most emblematic natural wonders throughout its main lobby. All the rooms in the hotel have a piece of Ñandutí framed and hung in the room. The Holiday Inn Express Asunción Aviadores hotel is owned by Ventura Inversiones S.A. and managed by Cell Motion S.A. The hotel is part of IHG’s diverse family of brands in nearly 100 countries and territories. Designed to provide guests with everything they need and nothing they don’t, the hotel’s amenities include complimentary Express Start® breakfast buffet, a 24-hour convenience store, fitness center, an outdoor swimming pool and a business center with two modern meeting rooms. The hotel also offers complimentary coffee in the lobby and accepts off-site restaurant delivery. Guestrooms have modern design, comfortable king-sized or two queen-sized high-quality beds with a choice of firm or soft pillows for a restful night’s sleep, flat-screen TV, iron and ironing board, mini refrigerator and coffee machine with complimentary coffee. The complimentary Express Start® breakfast buffet features a full range of breakfast items, including a rotation of egg and meat selections, pastries, yogurt, fruit, coffee, juices, and regional dishes. 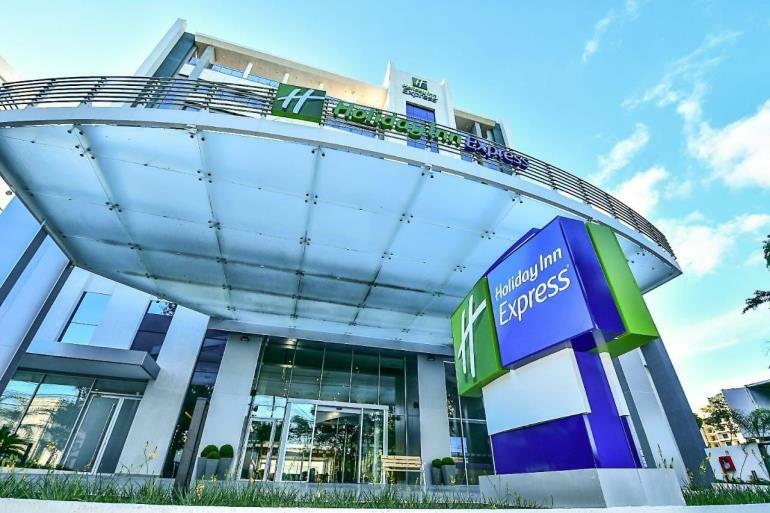 As IHG’s largest and fastest growing hotel brand globally, Holiday Inn Express currently has 85 properties located throughout Mexico, Latin America and the Caribbean. IHG has 239 hotels across all brands and more than 40,216 rooms throughout Mexico, Latin America and the Caribbean. The scale and diversity of the IHG family of brands means that its hotels can meet guests’ needs whatever the occasion – whether an overnight getaway, a business trip, a family celebration or a once-in-a-lifetime experience. Reservations can be made by calling 1-800-HOLIDAY or by going to IHG.com/HolidayInnExpress. The Holiday Inn Express brand participates in IHG® Rewards Club. The industry’s first and largest hotel rewards program is free, and guests can enroll at IHGRewardsClub.com, by downloading the IHG® App, by calling 1-888-211-9874 or by inquiring at the front desk of any of IHG’s more than 5,400 hotels worldwide.